But when shown with the avant-garde works from Europe that dominated the public’s perception of the show, there was no way an impressionist canvas like this could seem anything but quaint and outmoded. Even in 1913, Hassam had to admit that the critics and the public alike were becoming less interested in American Impressionism. He lamented both the popularity of the Armory Show and the diminishing market for his and his friends’ work in a letter to the painter Julian Alden Weir in March 1913: “The International closed with a record attendance and miles of rubbish written about it. There is no news here. Nothing selling.”  In spite of the writing he saw on the wall, Hassam refused to change his style or update his subject matter, and the works that he saw at the Armory Show had virtually no impact on his work. He remained alienated from advanced art and forward-thinking critics until his death in 1935. See Piazza di Spagna, Rome (Newark Museum, New Jersey); The Spanish Steps of Rome (Christie’s, New York, sale cat., December 4, 1987, lot 208); and Rome (Christie’s, New York, sale cat., June 3, 1983, lot 191). Milton Brown, The Story of the Armory Show, 2nd ed. (New York: Abbeville Press, 1988), 88. Childe Hassam to Julian Alden Weir, March 21, 1913, Julian Alden Weir Papers, Archives of American Art, Smithsonian Institution, microfilm reel 125, frame 315. After the Armory Show Hassam engaged in the debate over what constituted “genuine” art. He felt that much of the contemporary European work in the exhibition was “fraudulent,” a group of “absurdities” assembled by the organizers in an attempt to attract attention and make money. 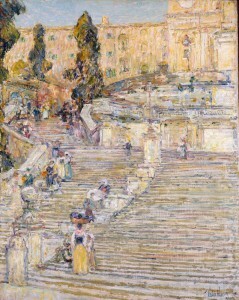 Over the years he made no attempt to hide his disdain for modern art and jumped at any opportunity to rail against the more advanced paintings in the Armory Show as “shockingly foolish,” “idiotic,” and “extreme.”  This strident defense of American art, and vitriolic attitude toward European modernism, reflected not only Hassam’s own pride in his New England ancestry, but also the spirit of isolation and cultural nationalism that grew in the United States in the 1920s and 1930s. Childe Hassam to Walt Kuhn, January 15, 1912, Walt Kuhn Family Papers, Series 2: Association of American Painters and Sculptors (AAPS) Records, 1911-1914, Archives of American Art, Smithsonian Institutition, box 3, folder 3, image 25. H. Barbara Weinberg, “Introduction,” in H. Barbara Weinberg, ed., Childe Hassam: American Impressionist, exh. cat. (New York: Metropolitan Museum of Art, 2004), 18. Childe Hassam, “Twenty-Five Years of American Painting,” Art News 26 (April 14, 1928), 22; and De Witt M. Lockman Interviews with Artists, February 2, 1927, New-York Historical Society, microfilm reel 2, frame 383. Childe Hassam, “Twenty-Five Years of American Painting,” 22.